Motowitch Chronicles Motorcycle Podcast | Listen Free on Castbox. Motowitch Chronicles is the motorcycle podcast that brings you stories of badass female bikers from around the world. Your host, Kojii Helnwein chats to women about the obstacles they’ve overcome, the adventures they’ve embarked upon, the world records they’ve set or the awareness they’ve raised for various charities they hold close to their hearts and why. Subscribe to hear these accounts of worldwide female bikers, from all walks of life and prepare to be inspired to live your life to the fullest. What is Motowitch Chronicles all about? You may already be familiar with Imogen Lehtonen either through her family’s business, The Great Frog, whose stunning silver jewelry adorns the likes of Led Zeppelin, Motorhead, or Motley Crue, to name just a few OR her beautiful instagram account that gives us all a peek into that LA, rock 'n' roll motorcycle life. Maybe you know her from that time she rode alongside Norman Reedus on his TV show “Ride”. Imogen Lehtonen talks to our host Kojii Helnwein about all things Great Frog, how her motolife started, her journey across the USA on a Harley, how she met Norman Reedus and rode with him up the PCH and her journey through the Italian countryside for Ducati. You can follow Imogen's motolife at www.instagram.com/imogenocide Her store https://www.thegreatfroglondon.com/ This episode of Motowitch Chronicles is brought to you by MOTOWITCH COLLECTIVE. At www.motowitch.com we host MOTOWITCH MAG, a collection of articles, road logs, tips and more written by worldwide female motorcyclists, be they seasoned, brand new, world record holders, driving instructors and so on. Subscribe at www.motowitch.com or on your favourite podcast app to be sure you don't miss our future episodes. For daily updates follow us on Instagram www.instagram.com/motowitchcollective or Facebook www.facebook.com/motowitch If you're a female biker with a story you'd like to share on either MOTOWITCH MAG or MOTOWITCH CHRONICLES please email hello@motowitch.com. We'd love to hear from you. Janelle Kaz has ridden solo across the USA, Laos in South East Asia, and currently in Colombia. She is adventuring alone on her motorcycle to promote anti-wildlife trafficking and poaching while educating people about wildlife and their environment in remote villages. Listen in as she talks about why she chose to do this by motorcycle, why she feels it's an important issue to fight and her thoughts on life as a solo female adventurer. If you would like to follow Janelle's journey, she can be found on instagram at www.instagram.com/motogypsy This episode of Motowitch Chronicles is brought to you by MOTOWITCH COLLECTIVE. At www.motowitch.com we host MOTOWITCH MAG a collection of written articles, road logs, tips and more by worldwide female motorcyclists, be they seasoned, brand new, world record holders, driving instructors and so on. Subscribe at www.motowitch.com or on your favourite podacst app if you don't want to miss our future episodes. For daily updates follow us on Instagram www.instagram.com/motowitchcollective or Facebook www.facebook.com/motowitch If you're a female biker with a story you'd like to share on either MOTOWITCH MAG or MOTOWITCH CHRONICLES please email hello@motowitch.com. We'd love to hear from you. Shasta Smith, Designer, Motorcycle builder, Entrepreneur and owner of The Vintage Monkey in Sacramento California, shares her many years of experience in not only riding motorcycles but also building them. She talks us through her Television career, her background in Interiors and Architecture and how that all lead her to open an incredible classic bike repair shop, motorcycle exhibit, venue and now learning space for local bikers. You can connect with Shasta and The Vintage Monkey at their website http://www.thevintagemonkey.com or on Instagram https://www.instagram.com/thevintagemonkey5 She chats with host, Kojii Helnwein about her charitable causes, the female biking community and being a woman in business. She also parts with some valuable advice on DIY motorcycle maintenance and building. Links mentioned: DGR (Distinguished Gentleman's Ride): https://www.gentlemansride.com This episode of Motowitch Chronicles is brought to you by MOTOWITCH COLLECTIVE. At www.motowitch.com we host MOTOWITCH MAG, a collection of articles, road logs, tips and more written by worldwide female motorcyclists, be they seasoned, brand new, world record holders, driving instructors and so on. Subscribe at www.motowitch.com or on your favourite podcast app to be sure you don't miss our future episodes. For daily updates follow us on Instagram www.instagram.com/motowitchcollective or Facebook www.facebook.com/motowitch If you're a female biker with a story you'd like to share on either MOTOWITCH MAG or MOTOWITCH CHRONICLES please email hello@motowitch.com. We'd love to hear from you. Linda Bootherstone-Bick chats with your host Kojii Helnwein about her 50 years of adventure riding, how she got started, tips for people considering hitting the road themselves and the psychology of coming home to everyday life after an adventure. A three time author, an artist, a wonderful folk musician and one of the most experienced Adventure riders out there, Linda Bootherstone-Bick brings us an episode that cannot be missed. Want to keep up with Linda? Check out her website here: http://www.lindab.id.au Links mentioned by Linda in this episode: http://www.wimaworld.com http://www.horizonsunlimited.com/ http://www.adventuretravelfilmfestival.com This episode of Motowitch Chronicles is brought to you by MOTOWITCH COLLECTIVE. At www.motowitch.com we host MOTOWITCH MAG, a collection of articles, road logs, tips and more written by worldwide female motorcyclists, be they seasoned, brand new, world record holders, driving instructors and so on. Subscribe at www.motowitch.com or on your favourite podcast app to be sure you don't miss our future episodes. For daily updates follow us on Instagram www.instagram.com/motowitchcollective or Facebook www.facebook.com/motowitch If you're a female biker with a story you'd like to share on either MOTOWITCH MAG or MOTOWITCH CHRONICLES please email hello@motowitch.com. We'd love to hear from you. Rosie Gabrielle is a solo motorcycle adventure rider, photographer + videographer who has explored the world while inspiring others via her honest look into life on the road through her Youtube and Instagram Channels @rosiegabrielle In this episode Rosie chats with your host Kojii Helnwein about how she started out in adventure riding, what equipment she brings with her to capture such awe-inspiring imagery, how she ended up travelling with her bestie, Winston the Dog and even tips for new riders amongst so much more. Want to keep up with Rosie? Head over to our website to access all of her links in the show notes. 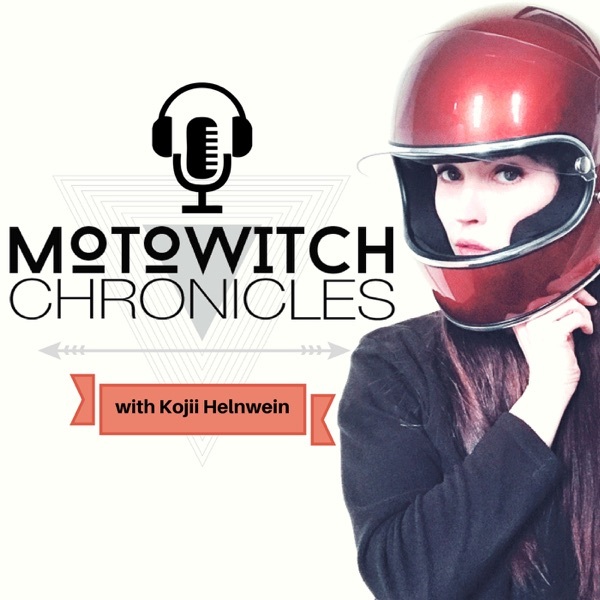 https://motowitch.com/rosie-gabrielle-solo-adventure-rider/ This episode of Motowitch Chronicles is brought to you by MOTOWITCH COLLECTIVE. At www.motowitch.com we host MOTOWITCH MAG, a collection of articles, road logs, tips and more written by worldwide female motorcyclists, be they seasoned, brand new, world record holders, driving instructors and so on. Subscribe at www.motowitch.com or on your favourite podcast app to be sure you don't miss our future episodes. For daily updates follow us on Instagram www.instagram.com/motowitchcollective or Facebook www.facebook.com/motowitch If you're a female biker with a story you'd like to share on either MOTOWITCH MAG or MOTOWITCH CHRONICLES please email hello@motowitch.com. We'd love to hear from you. Alexi Fisk moved from Brooklyn, NY to Seoul, South Korea in 2016 and little did she know her life was about to become more full than she could ever dream. Through her new found love of motorcycles and the search for more like-minded women she inadvertently founded South Korea’s only all-female motorcycle group which grew to become a movement unto itself. Alexi chats with your host, Kojii Helnwein about how Danger Dames was born, motorcycles, a clash of cultures, sexism and accidentally starting a feminist movement in the South Korean motorcycle community. Want to keep up with Alexi and the Danger Dames? Head over to our website to access all of her links in the show notes. www.motowitch.com/podcast This episode of Motowitch Chronicles is brought to you by MOTOWITCH COLLECTIVE. At www.motowitch.com we host MOTOWITCH MAG, a collection of articles, road logs, tips and more written by worldwide female motorcyclists, be they seasoned, brand new, world record holders, driving instructors and more. Subscribe at www.motowitch.com or on your favourite podcast app to be sure you don't miss our future episodes. For daily updates follow us on Instagram www.instagram.com/motowitchcollective or Facebook www.facebook.com/motowitch If you're a female biker with a story you'd like to share on either MOTOWITCH MAG or MOTOWITCH CHRONICLES please email hello@motowitch.com. We'd love to hear from you. Some time ago, Kojii Helnwein rode out on her Royal Enfield with Becky from Full Throttle Ireland on her ER6F. They journeyed 90 miles from Tipperary to Dublin and sat down with Jacqui Furneaux to bring you Episode 8 of the Motowitch Chronicles and Full Throttle Ireland’s Motovlog 5. https://youtu.be/xvaE0JvPAdw Jacqui Furneaux is a woman who has learned to go with the flow and follow her heart while travelling the world on her motorcycle. Having found adventure on two wheels later in life she took to it like it was all she had ever known. Listen in as Jacqui chats with Kojii about life on the road, how she ended up there, her Royal Enfield, love and her wonderful book “Hit the road Jac”. Mentioned by Jacqui: http://www.jacquifurneaux.com/ http://www.horizonsunlimited.com/ https://www.amazon.co.uk/Hit-road-Jac-twenty-countries/dp/0956430562/ref=sr_1_1?ie=UTF8&qid=1504867510&sr=8-1&keywords=jacqui+furneaux This episode of Motowitch Chronicles is brought to you by MOTOWITCH COLLECTIVE. At www.motowitch.com we host MOTOWITCH MAG, a collection of articles, road logs, tips and more written by worldwide female motorcyclists, be they seasoned, brand new, world record holders, driving instructors and so on. Subscribe at www.motowitch.com or on your favourite podcast app to be sure you don't miss our future episodes. For daily updates follow us on Instagram www.instagram.com/motowitchcollective or Facebook www.facebook.com/motowitch If you're a female biker with a story you'd like to share on either MOTOWITCH MAG or MOTOWITCH CHRONICLES please email hello@motowitch.com. We'd love to hear from you.